Nathalie Traller (16) has been diagnosed with Stage IV ASPS – (Alveolar Soft Part Sarcoma), a rare pediatric sarcoma without known chemotherapy. Nathalie Traller (15) has been diagnosed with Stage IV ASPS – (Alveolar Soft Part Sarcoma), a rare pediatric sarcoma without known chemotherapy. 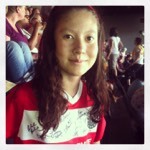 Since Nathalie’s diagnosis in April 2012, her parents have explored each clinical trial and treatment option available. She has valiantly come back from ten surgeries and continues to surprise her doctors on the east and west coast. Knowing last September that the cancer was continuing to spread, sarcoma experts around the country pointed Nathalie’s family towards emerging anti-PD1 immunotherapy. Because of age, she was unable to participate in at least six recruiting clinical trials she otherwise meets criteria for. A successful nine-month campaign to bring her access has meant a chance for Nathalie to try what our systems denied her! We are so grateful to those who have joined us. Through this journey we have learned much about what needs to change to truly make a difference for childhood cancer. We ask you to join us in making a lasting difference for ALL those young people fight cancer. Facebook's complex newsfeed algorithm decides what is worthy based on activity, time, your connection to friends and so on. Interestingly "commenting" scores high. So please like and comment every time you see a post or update. You can even like and comment your own post. You can always just comment #kickASPS! 3. Write a letter to call our government to action. 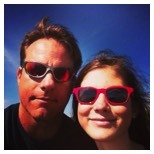 In support of Nathalie Traller and her family, I'm writing to ask for your help. Nathalie is a 16 year-old girl from Beaverton, Oregon who is battling for her life. She was diagnosed with a very rare form of cancer (Alveolar Soft Part Sarcoma) two years ago. Her family has been joined by thousands (including public servants such as yourselves) who have advocated to help her access therapies often unavailable to pediatric patients. Along the way, her family has learned just how limited the fight against children’s cancer is. There are no market forces driving research and thus many pediatric cancers are using 30-year old chemotherapies. An increased share of NCI research funding dedicated to childhood cancers would make a powerful difference. Legislation to encourage pharmaceutical development of new and novel pediatric cancer therapies through incentives could bring hope. It’s time to cut the red tape originally designed to protect children which instead makes creating clinical trial for ages below 18 unpalatable for drug companies. Having no treatments is not protecting our children - it is shameful and dooms them to pain and suffering while we bask in the advances of cancers that impact those with stronger voices and deeper wallets. Legislation that asks clinical trial age limits to be based in science and justified if receiving government funding will remove the artificial ceiling that keeps out our youth. Anything you can do to help problem-solve, create new pathways for research, partnerships with pharmaceutical companies, and remove roadblocks to this fight against childhood cancer will be greatly appreciated. 5. Please continue to pray for Nathalie and her family. 6. How Can Kids Help? Thank you for your help. 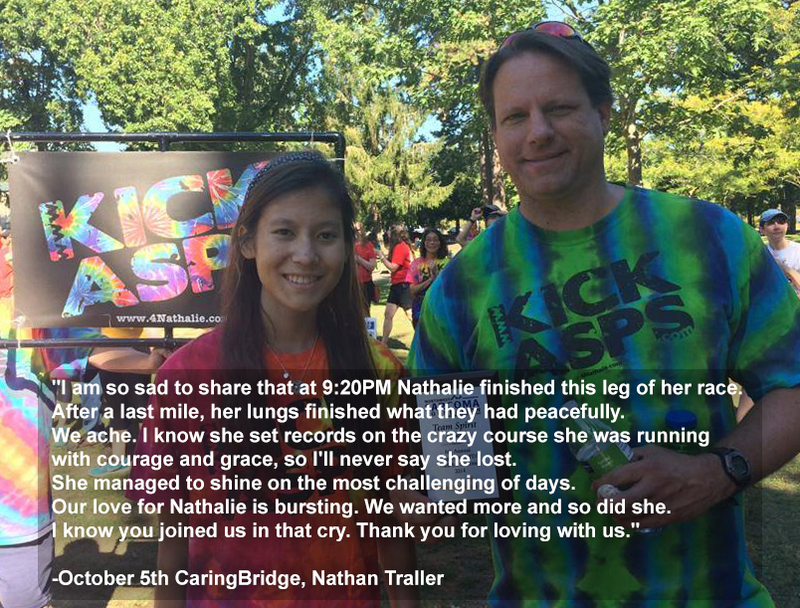 Please invite others to support 4Nathalie as we walk forward.